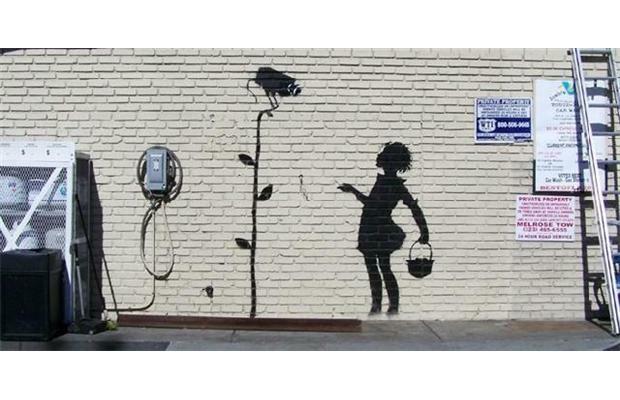 A Los Angeles petrol station owner is selling a piece by perhaps the world’s best-known graffiti artist. 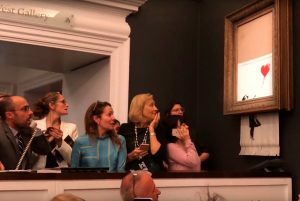 Flower Girl, by Banksy, is up for sale on Thursday at Julien’s Auctions in Beverly Hills. 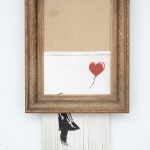 The petrol station owner, Eytan Rosenberg, says he did not know who Banksy was when a friend of a friend asked if the British street artist could paint on his garage’s wall. The work depicts a young girl with a basket of flowers and a security camera looming over her like a vulture. When Rosenberg sold his family petrol station last year, he painstakingly removed the painting and installed it in a sturdy aluminium frame. 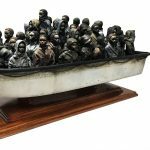 The auctioneer Michael Doyle says the 2.7 metre by 2.4 metre (9ft by 8ft) piece could fetch more than $300,000 at auction. 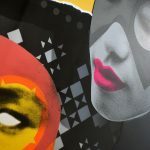 This entry was posted in NEWS and tagged Banksy, California, Los Angeles, Street Art, United States. Bookmark the permalink.